“Last month’s article in praise of the Axedale Public Hall inspired a couple of locals to contact the Antics and pass on a few memories. We welcome this feedback and hope that more of you will be inspired to add your own snippets of information to our fund of local knowledge. Apparently, in it’s hey day, the Axedale Hall had the reputation of having the best dance floor anywhere in the district and people came from far and wide to do the Pride of Erin, the Barn Dance, Maxina, Charmaine, Evening Three Step, Modern Waltz and the Foxtrot, among other old time dances. The hall custodians prepared the floor by scattering wax flakes or crystals and then ‘bagging’ the floor. Sometimes a box, covered in hessian or carpet was used and often small children helped the operation by riding on the bags or on top of the box, to add a bit of weight. The Dunlop family have been closely associated with the hall and Roy Dunlop was the regular M.C. or Master of Ceremonies. Peter and Kate Dunlop continue this involvement; Peter being the Secretary of the Hall Committee. Music for the dancing was usually just provided by the piano and drums, and Maisie Evans and Win Byrne were regular pianists with Les Giri on the drums. Power for the dances, balls, and other entertainments was provided by a generator powered by an old Fordson tractor, which on occasions was notoriously difficult to start. There was a house on the corner of McIvor Highway and Mitchell Street, where the barbecue now stands, and the tractor was kept there, at the ready. Before it’s demolition, the house was the residence of the two Misses Ryan. 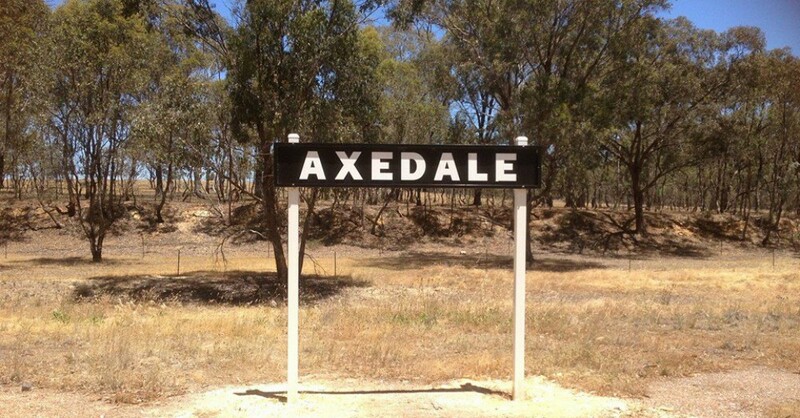 Although it is hard for us to imagine life without electricity, it only came to Axedale in December 1955, and country life was beginning to change. Young people were beginning to be known as ‘teenagers’. Some of them were even getting their own cars at 18 years of age, (although at Bendigo Teachers College in 1955, only 3 out of 200 had a car). Rock and Roll music became popular. Shock horror, Elvis Presley ousted Johnny Ray (of ‘Crying’ Fame) and Bill Haley and The Comets burst onto the scene in the film “Rock Around The Clock’. The first drive-in picture theatre opened in 1956 and competed with The Lyric, The Plaza, and The Princess, which were the existing Bendigo picture theatres at that time. November 1956 saw the arrival of TV, in time for the Melbourne Olympic Games, and even the liquor licences were changing. We said goodbye to the ‘6 o’clock swill’ and social life changed. Young people were mobile, dinner dances became popular, and by the time I returned to this district in 1965, the hall was used infrequently and carried a burden of debt. Sometimes a new resident comes to a town, views the scene from a new perspective, and decides to make a difference. Such a person was Senior Constable A.E. (Ted) Godkin, who came to Axedale from Nagambie in 1967. Ted could probably be described as a ‘sportsnut’. He was a champion lawn bowler and was immediately snapped up as a Pennant player by a top Bendigo club. He soon observed that Axedale had no sporting facilities at all apart from a sadly neglected public reserve, covered in 10ft high thistles, and a flat area where a couple of granite posts were the only remains of a tennis court. Then there was this beautiful hall, which stood like a white elephant, rarely used, and almost a liability to the community who still had to finish paying for it. Having played an indoor version of the game of bowls in earlier days, Ted could envisage a regular competition which would provide recreation for people of all ages and an income stream to the Hall Committee. He lost no time in borrowing the necessary bowls, mats and measuring equipment, and spread the word around the district. I’ll never forget the first bowls night. The Axedale people sat on one side of the hall while the Knowsley people sat on the other, because they didn’t really know each other at all well. The “Blowinskis” those of us who were new to the district, sat across the front while Ted explained the finer points. It took off like wildfire. We managed for a while with borrowed equipment but soon were able to purchase new mats and sets of bias bowls. Indoor bowls was played two nights each week, Wednesday and Saturday, and it wasn’t long before Tournaments and Championships were on the agenda. We were able to fit seven mats in the hall, so it was not uncommon to have more than 100 participants. With a regular rental income, the Hall Committee soon covered the existing debt and went from strength to strength. An extremely hard working Hall Committee Ladies Auxiliary ( a plaque in the hall commemorates a lifetime of service by Mon Colvin, 23 years as Secretary) ran an annual casserole luncheon, three debutante balls and formed a Euchre club.